Super Powered Fiction: The Horror Heroes are back! The Horror Heroes are back! I am proud to announce the new edition of Horror Heroes is on its way with a planned release date of October 19. I am equally proud of my story contribution to the new book continues my fascination with H. P. Lovecraft’s Deep Ones as I continue to carve out a place for the undersea race in the pages of the Quadrant Universe. While the new story does not have any connections with Dracula from Horror Heroes , it does continue my expansion of the darker side of the Quadrant Universe. Read the full press release from Metahuman Press below. Metahuman Press is proud to announce that Horror Heroes 2 is in the final stages of production for an October 19th launch in print and ebook forms. The follow up to 2013's anthology featuring supernatural creatures re-imagined as heroic figures by some of the best young authors in modern fiction continues the same trend with three all new tales featuring new versions of Frankenstein, Bigfoot and the Deep Ones. Anchoring the book is the new novella “Steamed!” by Darrin Albert, a very different take on the Bigfoot legend than anything that has come before it. Travis Hiltz brings “Frankenstein and the Rejects” to the world, introducing an entire team of malformed anti-heroes assembled by the legendary monster to fight evil at his side. Finally, project editor Nicholas Ahlhelm writes “The Beach House”, a tale of young love and sea monsters that creates a new future for the infamous Deep Ones made famous in “The Shadow Over Innsmouth” by H.P. Lovecraft. These three new tales come from Metahuman Press, the publisher famous (or infamous) for bringing a new generation of super powered fiction to print and screen. In addition to the previous volume of Horror Heroes, previous Metahuman Press releases include Pulpsploitation, I Was a Teenage Metahuman and Modern Pulp Heroes. 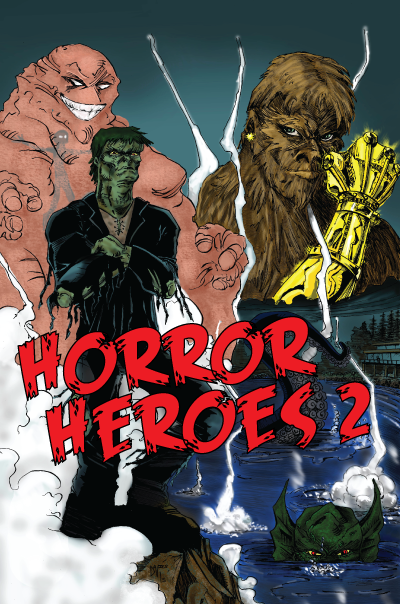 Horror Heroes 2 features a cover by John Davies and will be available in print and ebook format on October 19th through Amazon.com.